There’s been a lot of talk about shady operators in our field, but, let’s be honest, there are just as many problems with the marketing agencies out there. It’s not uncommon for a good center to end up contracting with an agency or even hiring someone internally that does things the wrong way. This is a HUGE deal as the center’s owner and CEO are legally responsible for any work done on their behalf, even by a third party provider. So, first key point, you must absolutely have full transparency and understand how your marketing team or partner is generating leads and inquiries. $200,000 and 10 years jail time is not worth the risk of not doing your due diligence here. I’ll go over some common pitfalls and then we’ll do some case studies. This is probably one of the most common things I see. The marketing agency fails to disclose how they are getting the inquiries, which is a huge red flag that they are engaging in patient brokering or other illegal activities, possibly falsifying reports of what they’re actually doing. When an agency is running Adwords, SEO, or Facebook ads for you, they should never, never, never run them on their own profiles, only from YOUR own. Not only is it against Terms of Service for these platforms, it means that you have no idea what they’re doing and what’s working or not working. Google Analytics, Adwords, and Facebook all have dashboards connected to business profiles. Your marketing agency MUST be using your profile, not theirs. If they don’t, not only can you not see what they’re doing, but they could also do things like charge you $10,000 for ad spend, spend only $1,000 of it, and then pocket the difference. They can also falsify reports and use them as a screen. So they send you some old Adwords report, photoshop the date and name (super easy), then email it to you. All the while, they’re actually working with some shady call center or doing patient brokering to send you leads. We just had a potential client reach out to us with this exact situation. The marketing company charged them $5,000 and was supposedly running Facebook ads. But no Facebook pixel was even installed on their site and the center didn’t know what they were doing. I can tell you from experience that this “agency” was patient brokering and just sending over an occasional admit. 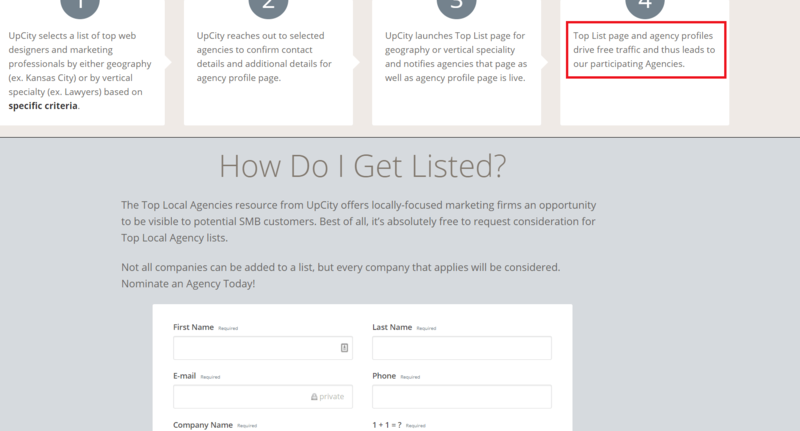 If an agency does not understand this field, they will fail in marketing your center. I can’t tell you how often we take over marketing from some previous all-purpose marketing agency, even ones charging $15,000 a month, and their campaigns have ZERO bearing on the field. Lots of pictures of junkies on the street or other fear-related tactics. Most of those serious about recovery and with the means/insurance to get it, have jobs and families like everyone else. Ads focused on fear and those at rock bottom perform very poorly. Sun, sand, and sea. These ads are equally as worthless. 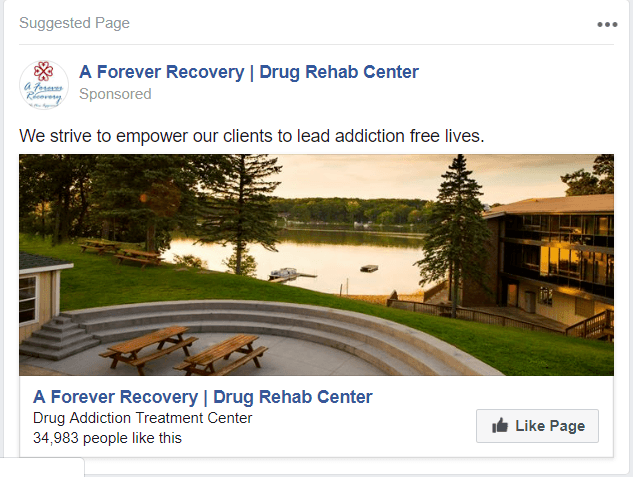 Someone struggling with addiction is not focused on the fact of whether or not your center is near a beach. All they want is to get the help for themselves or a loved one that they need. Addiction treatment is not a hospitality industry (though it seemed like it in some areas where patient brokering was rampant). You need specific messaging that speaks to their problems and their dreams, not photos of beaches, mountains, and pools. Don’t do the below. Selling your services in the first ad (these examples above are also guilty of that mistake). Outbound marketing campaigns are NOT Adwords. These people are not looking for treatment right now like a Google searcher. You need a nurturing sequence strategy for outbound campaigns on Facebook or other Internet platforms. The same goes for SEO. 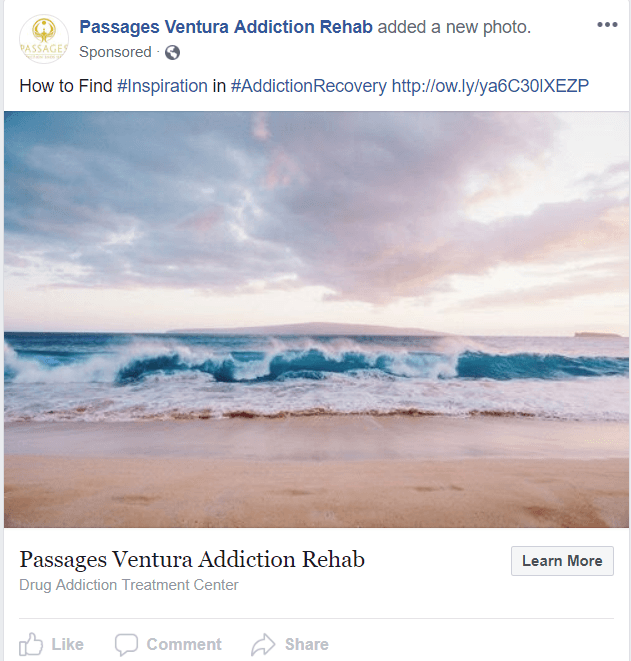 For search engine optimization to work, you need to build out long-form, relevant content with a strong backlinking strategy focused on addiction treatment. Here are the backlinks from a client we just signed on with who had some cheap Indian SEO firm doing their outreach. Fotothing? Nullads? Zoozads? These are spam sites. Not only is building a completely random backlink profile not going to help you, with links like these, Google is going to assume you’re doing black hat link building and you’ll get your site penalized, which will drop you in the rankings. Another thing we’ve seen is marketing agencies building what’s known as a Private Blog Network (PBN) of all their clients. This is also against Google policies and can get your site penalized. 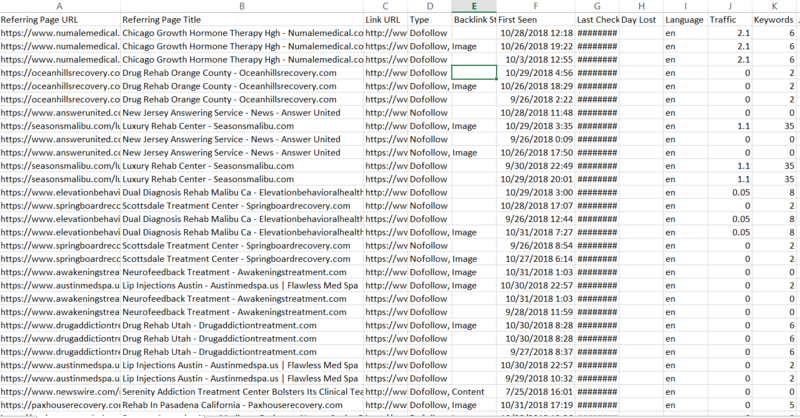 So let’s say my agency runs SEO for 4 other treatment centers. Since I control the sites, I just go ahead and put links across all the sites I’m running. So Pinnacle Treatment Center has a link to Serenity Treatment and vice versa. Not only is this likely to get you penalized and drop in rankings, it also means that you now have competitor links on your site. Do you want your treatment center linking out to some random competitor because your SEO firm is too lazy to get you real, quality links? So now they’ve got links from and to a growth hormone therapy site, a lip injection site, and over 20 other competitor treatment centers. Not cool. Here’s a horrible example of a marketing agency that’s just flat out lying. But how can you tell? We then follow that link and find out it’s just some random site where you can submit yourself to get displayed. You’ll notice none of the sites are ranked or reviewed, it’s just a listing that someone submitted and then there are options to pay to get higher placement. The entire purpose of the site, as it states in Step 4, is to get free traffic and leads to member sites. Now, here’s where it gets really bad. They’ve listed a bunch of fake reviews for themselves. They list their reviews on Clutch as proof of their effectiveness. Hmm, Vertex Healthcare Services gave them a glowing review. So, who is the owner? Let’s check LinkedIn. Turns out the reviewer also, “operates and oversees the day to day of Windows to Recovery.” It’s pretty bad when you don’t even get the name of your own company right (the website lists it as “window”). Talk about being ethical! 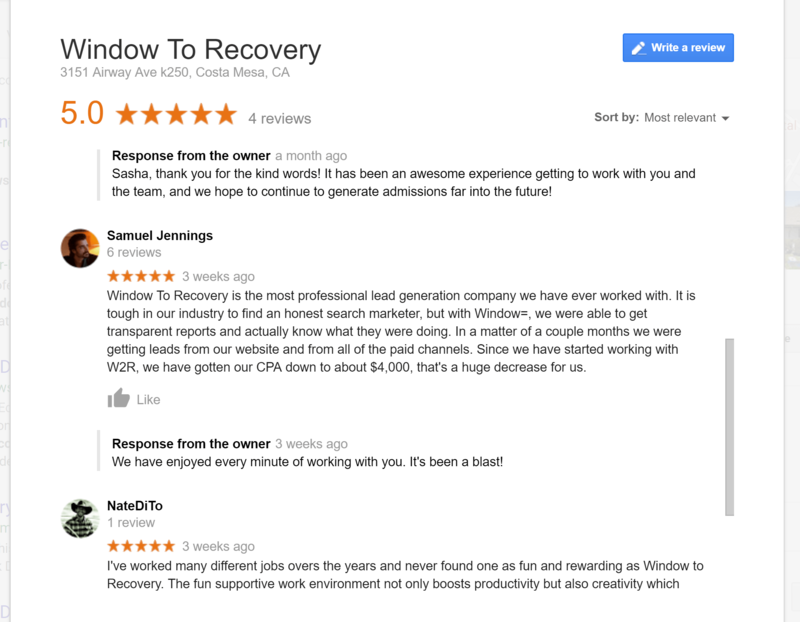 We then look at the Google Reviews for Windows (sic) to Recovery. 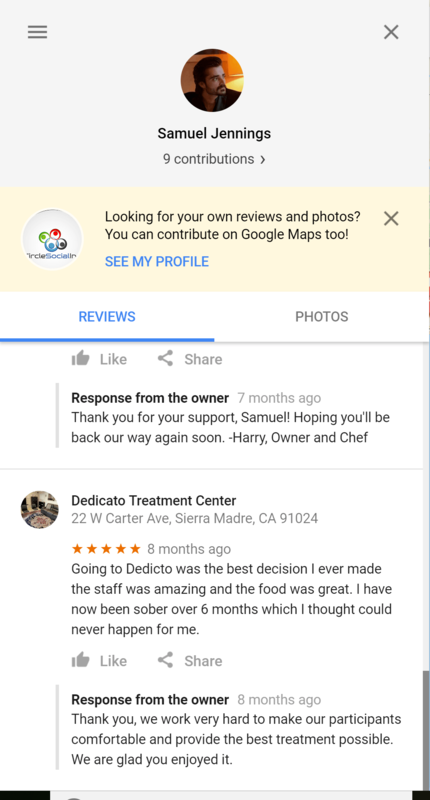 Well, they seem to have a couple nice Google reviews. Sasha and Nate are both employees, so let’s just skip them. We’ve got Johnny Peterson there with no picture. Google seems to have no info on him and he’s never reviewed anything else. 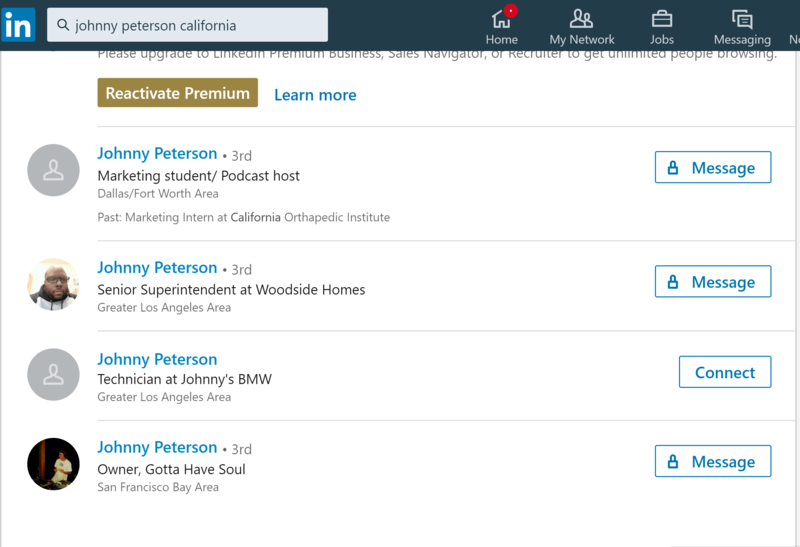 Let’s check LinkedIn because I don’t know of any treatment center owners that don’t have a LinkedIn profile. Well, let’s check out the next reviewer, Samuel Jennings. He seems to be a happy treatment center owner. I wonder what else he’s reviewed? 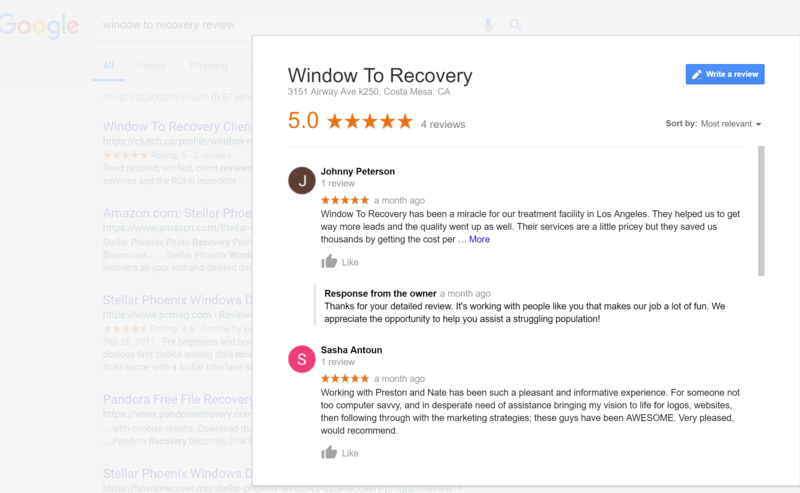 Looks like two other treatment centers, who, we can be pretty confident are clients of Window to Recovery. 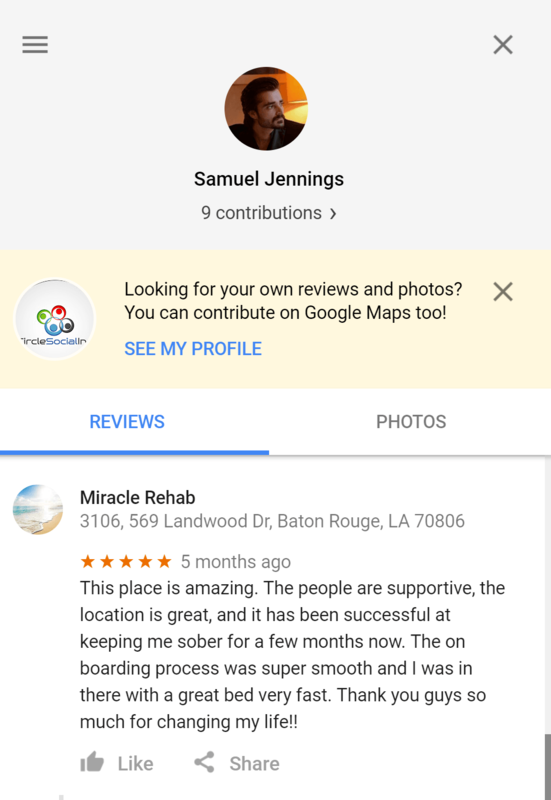 So Samuel Jennings is either an employee or simply someone they found on Upwork and paid to do reviews of them and their clients since he also has no record on LinkedIn. Here’s another good example – All in One Networking. They have a very solid looking website. They claim to do everything, web dev, SEO, PPC. Except they have no address on their website and no staff page to see who works there. Their Facebook link on the site doesn’t work either, but if we search on Facebook, we find a page. 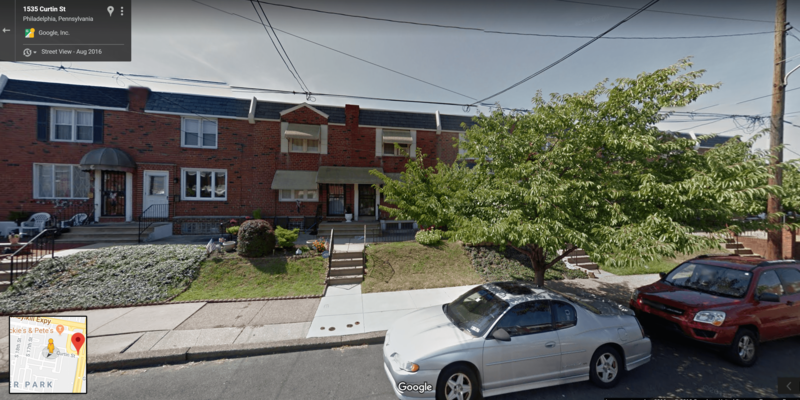 On Facebook, their address is listed as Curtin Street, Philadelphia. 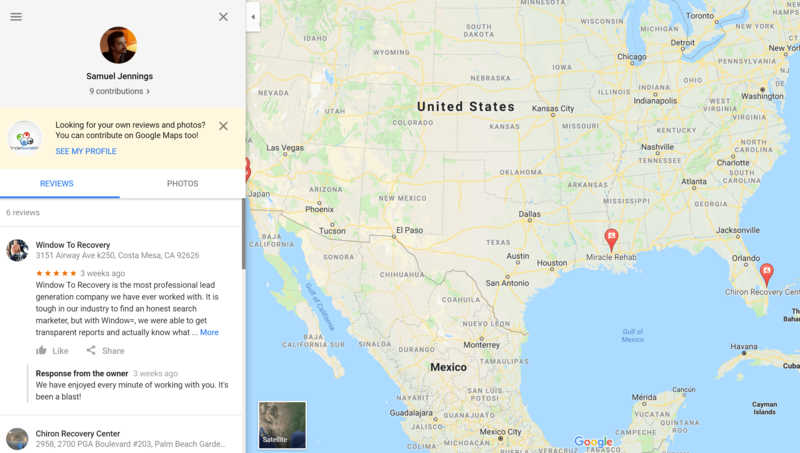 So let’s take a look at what Google maps pops up. It’s some random apartment building. So this “agency” is just some guy working out of his apartment. To make sure you’re not getting duped, it’s important to ask the right questions. What Are Some Key Questions to Ask a Potential Agency Partner? What kind of results have you gotten for other clients? What kind of timeline can we expect to get results in? (if it’s less than 3 months, they’re lying or doing patient brokering with one of the screens mentioned above). Will you use our accounts or your own? (If they use their own, HUGE red flag). For SEO, what kind of sites will you get us backlinks from? (They need to be coming from other healthcare and, preferably, addiction/recovery related sites of high domain authority. For Facebook, how many stages do you use in a typical nurture sequence? What are some examples of effective ad copy, images, strategy for a center like ours? The problem with marketing agencies is that they are similar to treatment centers, anyone can open one without a license or qualifications. 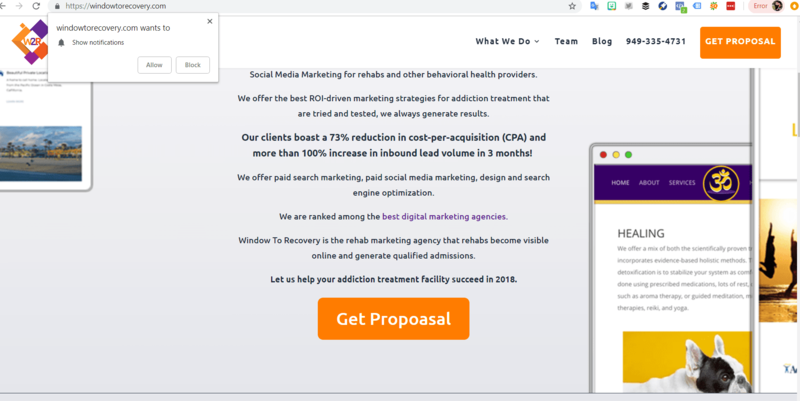 Additionally, just like shady treatment centers, they put up a lot of BS and smoke screens online stating they’re “the best,” “experts in the field,” “get amazing ROI immediately.” Let me be very blunt here, any treatment center that guarantees rapid ROI is lying. If they could produce quality inquiries immediately, at-will, they’d be billionaires and be working for major hospital and health care systems, not small treatment centers. The worst is when they guarantee a Cost-per-Admit (CPA). No one can guarantee that because it depends on the centers call and biz dev team to close those admissions. A bad admissions team converts at 1% or less, a good one at 10% for the exact same quality of inquiries. A marketing company can’t control how well your people do on the phone unless, like us, they provide additional support and training for the admissions and BD teams. As a center owner, it can be really hard to know who to trust, especially since SEO and online marketing aren’t part of your core skill set. But just some simple searches on LinkedIn and Google can often tell you what you need to know. In the addiction treatment space, there are only 3 good agencies I know of, ourselves, Dreamscape, and Incredible. Many others claim to work in the space, but have no specific strategies and just do a lot of generic marketing that doesn’t get results. Others pop up overnight. Use this guide to know what things to watch out for. Need help with your own marketing? Trust the experts. Get in touch with us using the form below.